Create a digital index card file with Personal Knowbase. Gather your notes, contacts, and more. 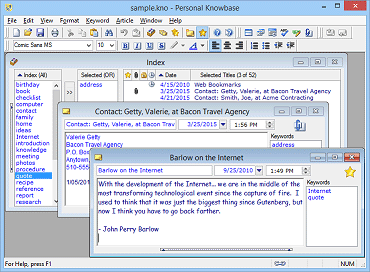 Personal Knowbase is easy-to-use note card software for Windows. Store all your notes, lists, clippings, ideas, contact information, and more on individual cards (notes) which can be sorted, linked, and organized using assigned keywords. Personal Knowbase can import Cardfile-format files directly. Directly import all your old Windows Cardfile CRD files. Index and categorize notes by tagging with keywords. Easily access related notes associated with one or more keywords. Store a large number of notes. No limits on number or length of notes. Whether or not you need to replace your old Cardfile software, Personal Knowbase can help you with note-taking and managing your information. When you first open Personal Knowbase, create a new, empty file by selecting the New command from the File menu. Import your Cardfile files using the Import command from the File menu. Select the Files of Type to be Card Files (*.crd), then browse to one of your files and Open it. If you don't want to start playing with keywords yet, you can bypass the subsequent Keywords for Imported Files dialog box by clicking OK with no keywords. This imports all the "cards" from your CRD file. Each "card" is referred to as an "article." Each card's title becomes the title of the Knowbase article, and each card's text portion becomes the content of the article. Note: This software can only import the text portion of CRD files. Any non-text (for example, graphical) portions of CRD files are not imported. You can see a list of your titles in the main Index window. Just double-click on a title to open an article. Then you can tag each article with keywords to index them. For more details, see our software Help topic for Importing from a Cardfile File. Get Personal Knowbase Note Card Management Software Today!